Just a little longer | Are We There Yet? 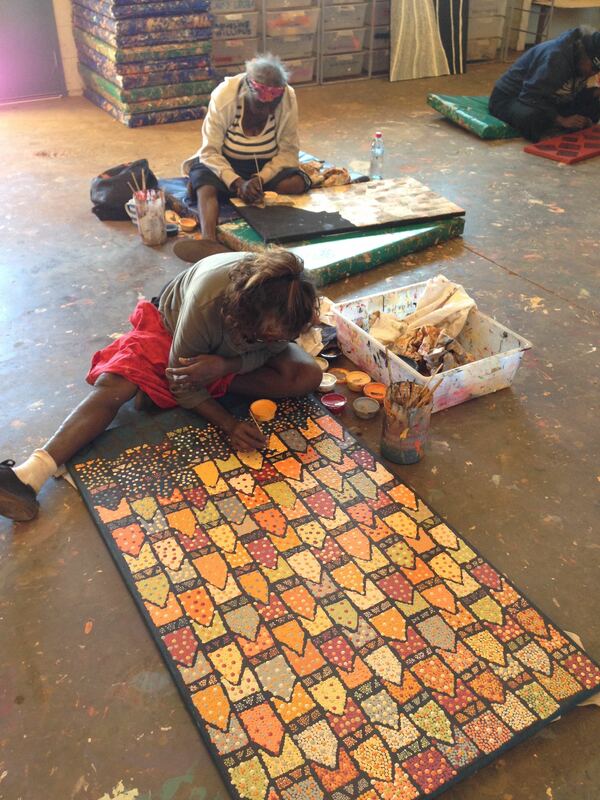 In our original plans we were to leave Alice today and head to Darwin for Darwin Aboriginal Art Fair next weekend. Then home. But we’re not ready to end this magical mystery tour yet – so we’ve extended our lease for 5 weeks. Will fly home on Tuesday 8th Sept after Desert Mob. That still isn’t enough time to do all we want to do, but it will be great to be home with family and friends. Too much is happening in our absence. Tyler and Mia are growing so fast. 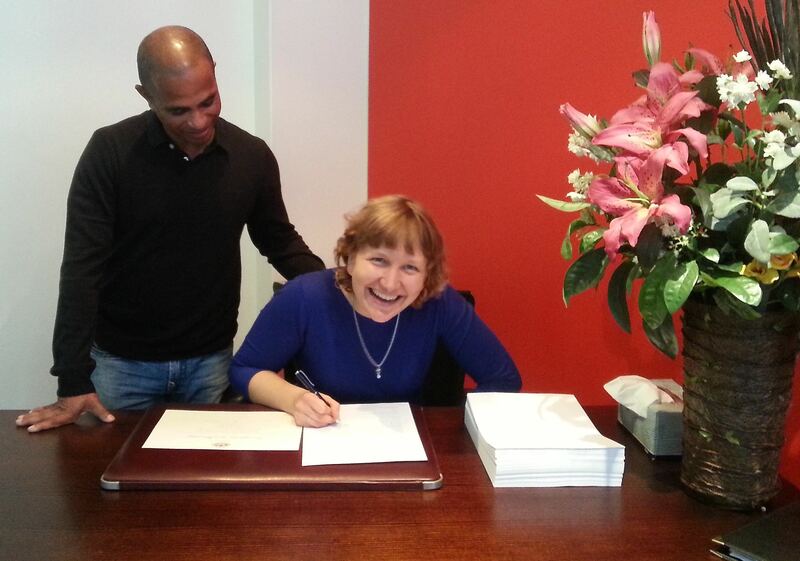 Em got married. Gulp. Sud was able to get a week away from his busy work schedule to come to Sydney so they took the opportunity to get married to start the 2 year process of applying for residency. 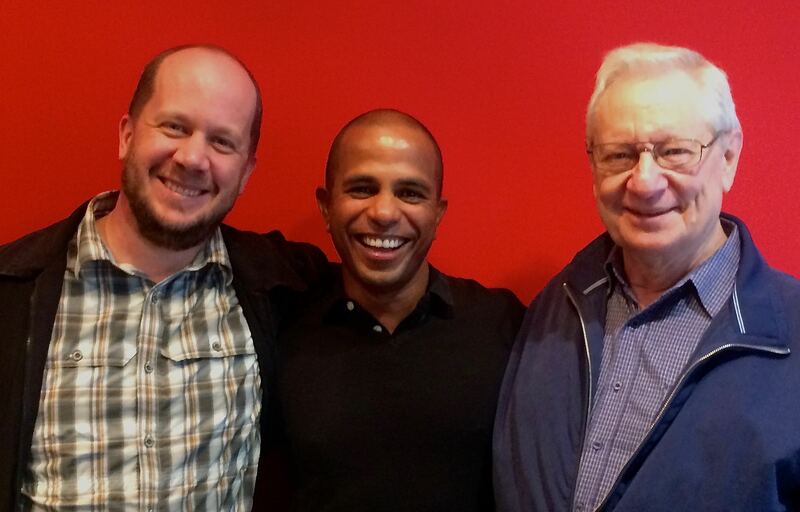 It’s great to see them both so happy. We were disappointed not to be able to be there, but they’ve promised to have two weddings next year for friends and family to celebrate with them, one in Sydney and one on India. 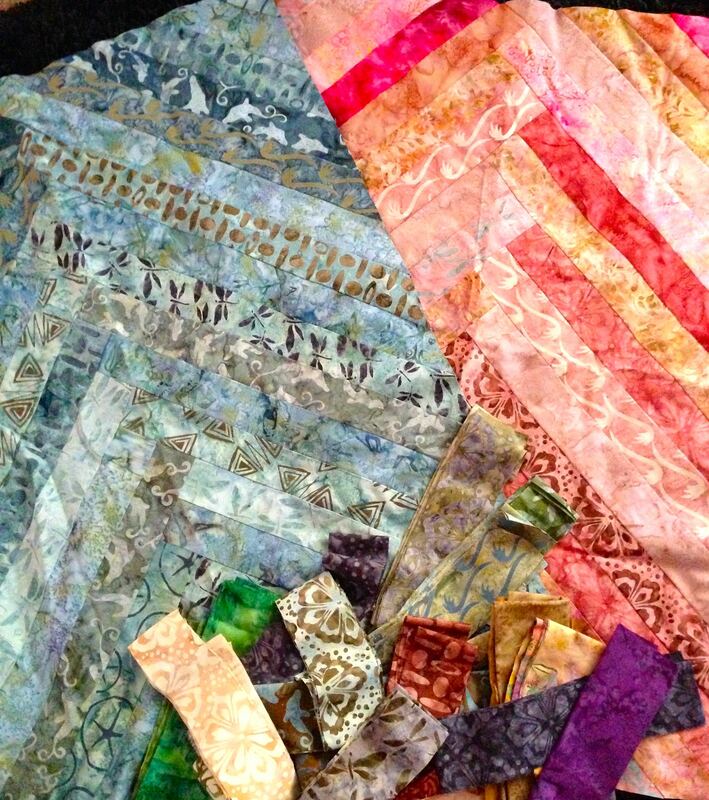 Maybe we need to start looking for saris? 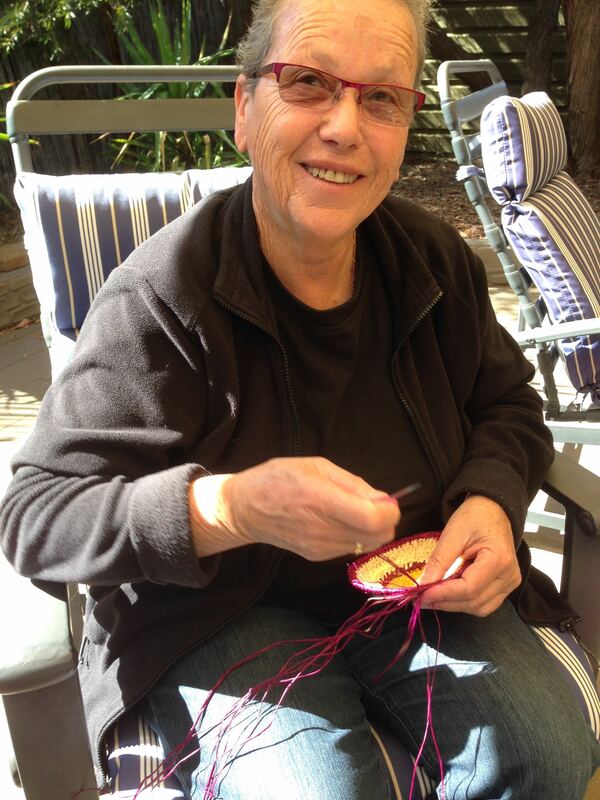 We’re also delighted to hear that Daf’s sister-in-law, Emily Hewson (widow of brother Bob), has become engaged to Bruce, a lovely man she met at her church in Maryborough. 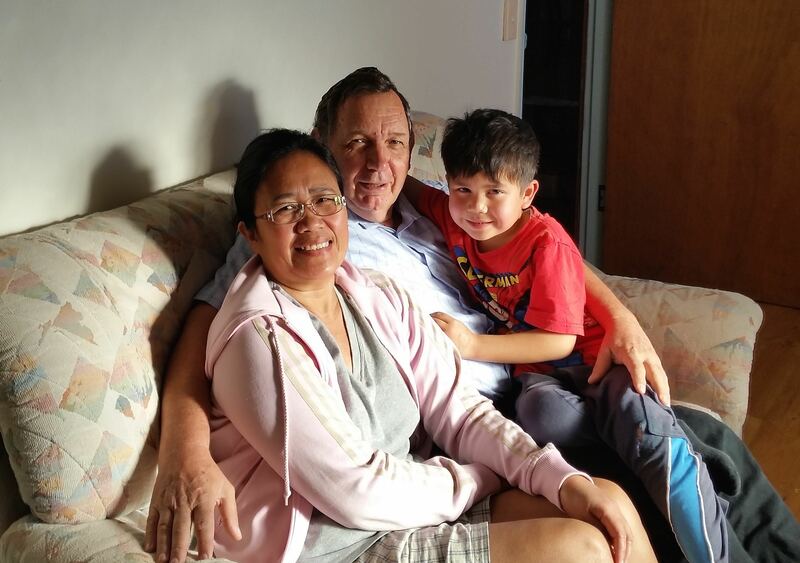 Emily and the kids, Ruth and Lawrence, are coming to Sydney for a visit soon after we get home. 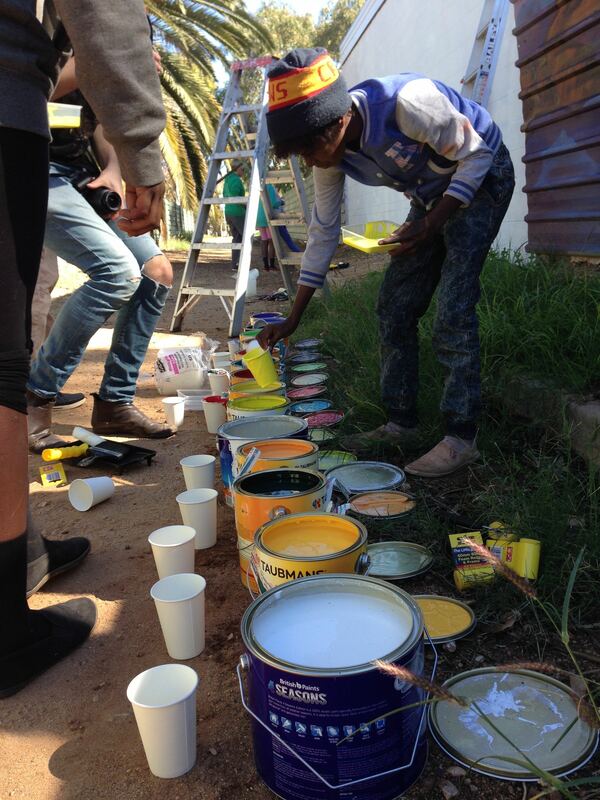 We were also lucky to be part of the painting project at Purple House. 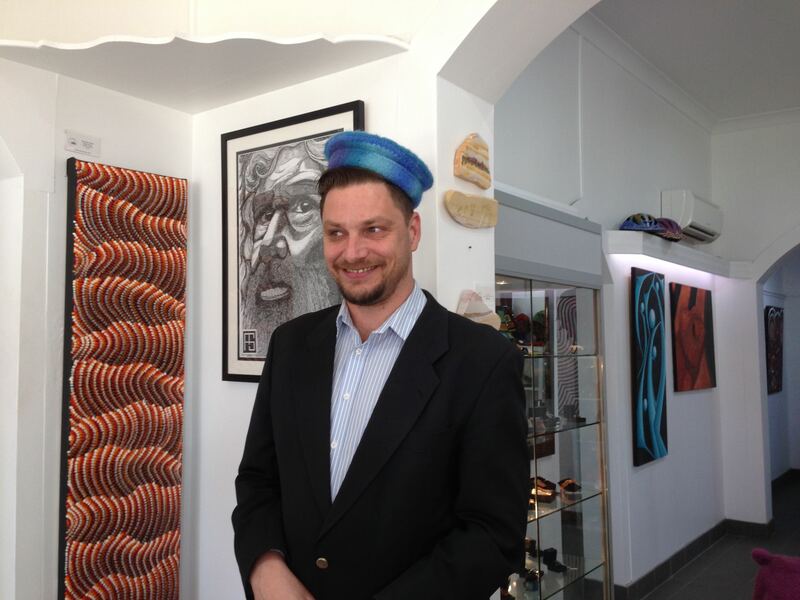 It was led by Max Levi Frieder of The Artolution. 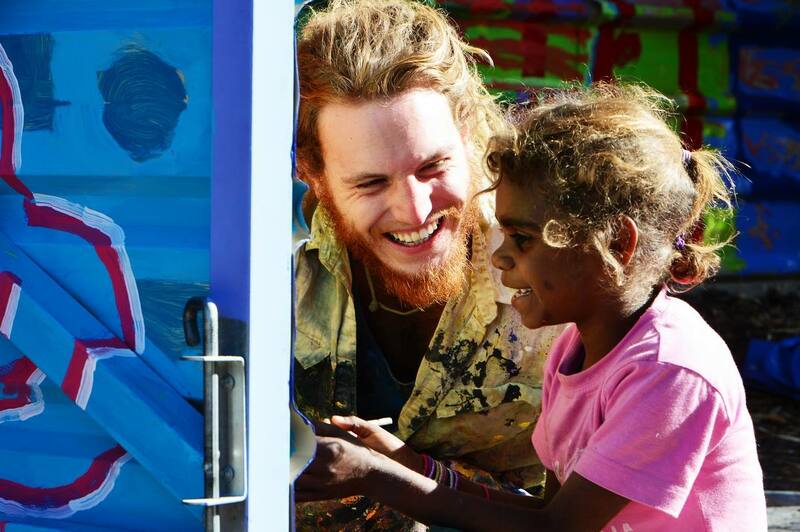 He travels around the world doing art projects in communities to build pride and connection. 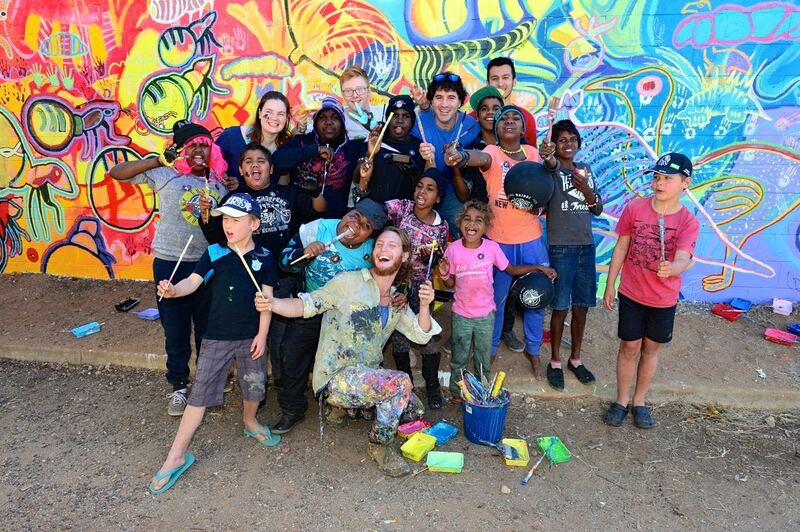 Young people came in from bush communities to help with painting the side wall of Purple House. 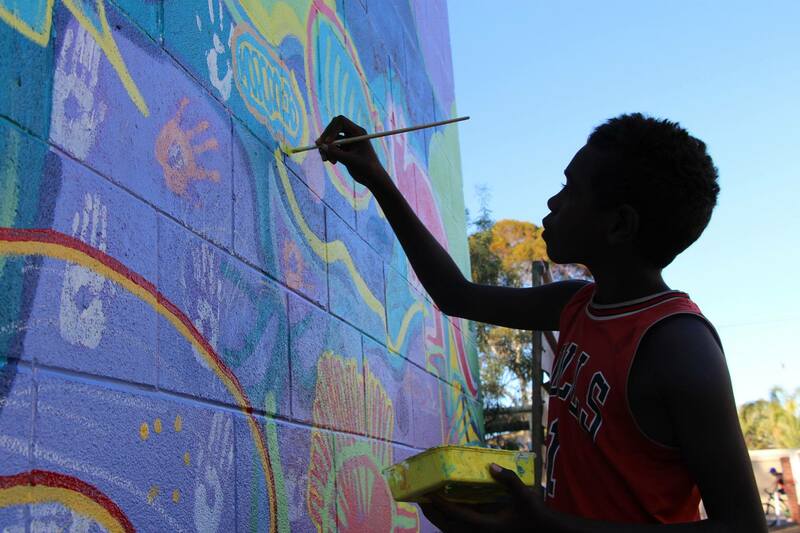 We all got involved over the 5 days of the project. Great fun. Daf pained a T and M (they look like animal tracks) into a red ball. A surprise for Tyler and Mia when they come to visit Alice with us one day. It’s on the bottom left corner of the photos of the full wall. 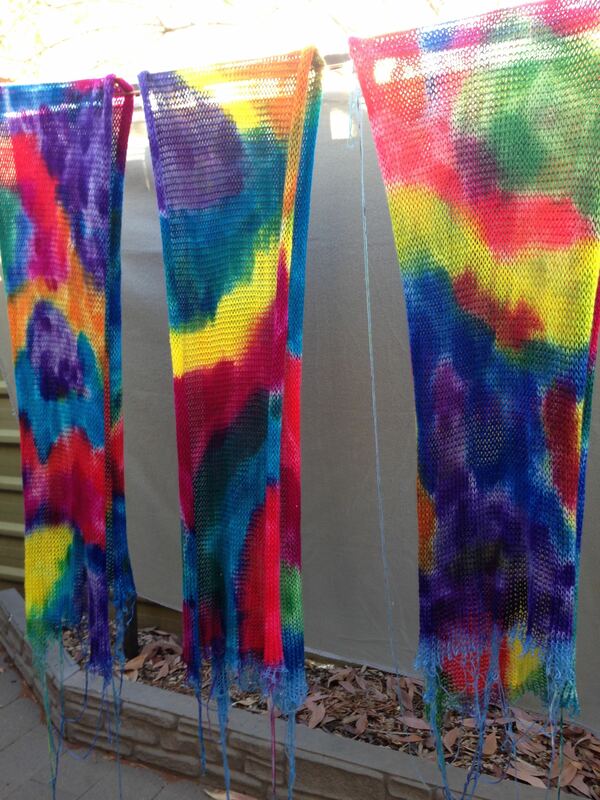 We’ve also been busy with crafts. 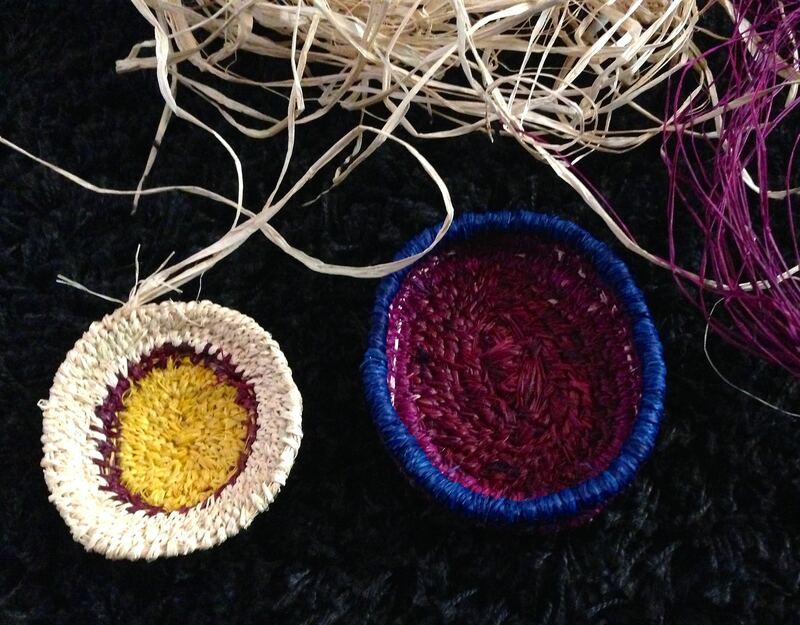 Basket weaving in the sun. First a beanie, now a basket, what next Jude? 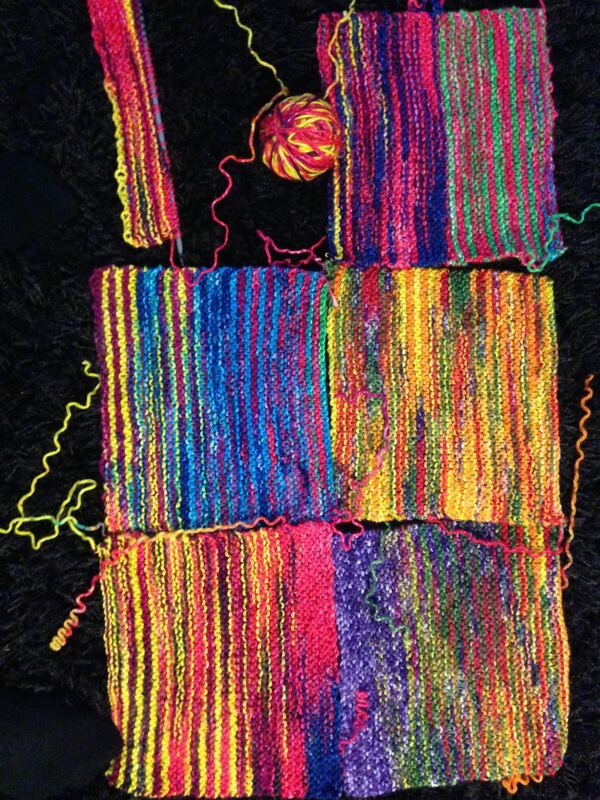 Wool “blanks” (skeins of wool that have been loose machine knitted as a base) that have been hand dyed. When they are dry we unravel them and roll into balls for knitting. 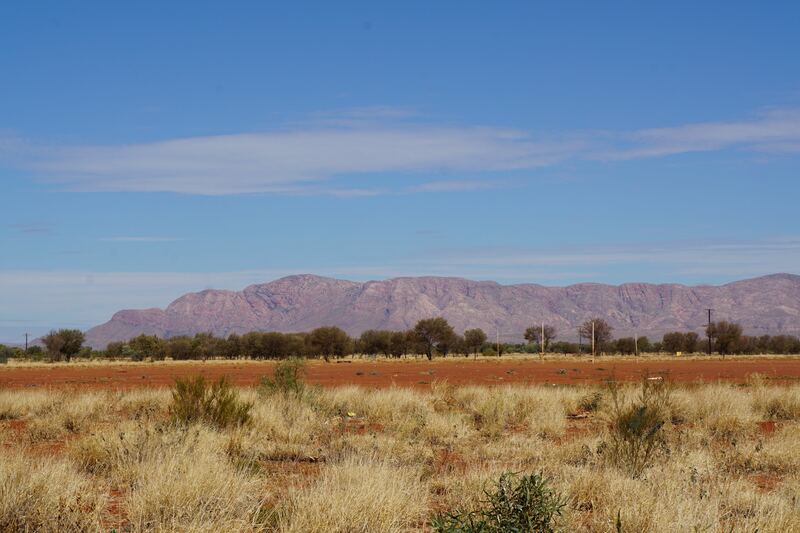 We had a wonderful couple of days at Papunya (3 hours drive west from Alice). 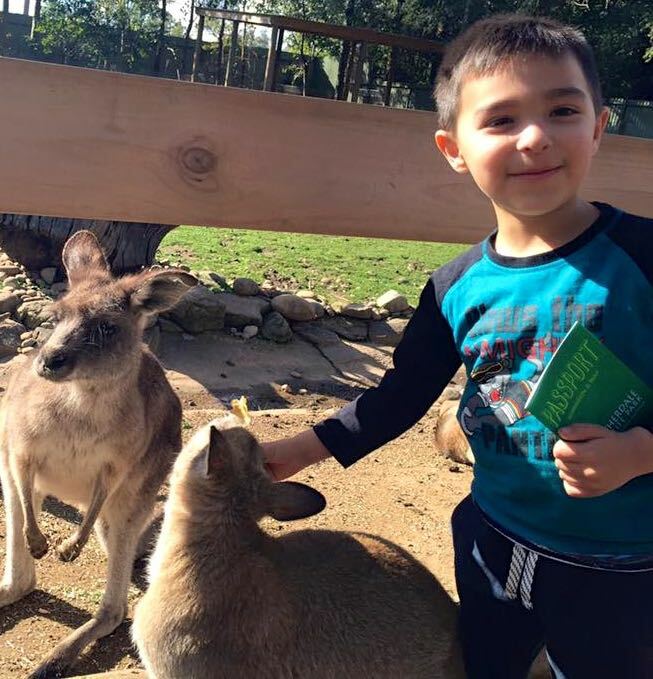 The plan was to continue on to Yuendemu, but Daf started having dizzy spells so we returned to Alice to get it checked (it’s called benign positional vertigo – nothing serious but very disruptive of everyday activities). 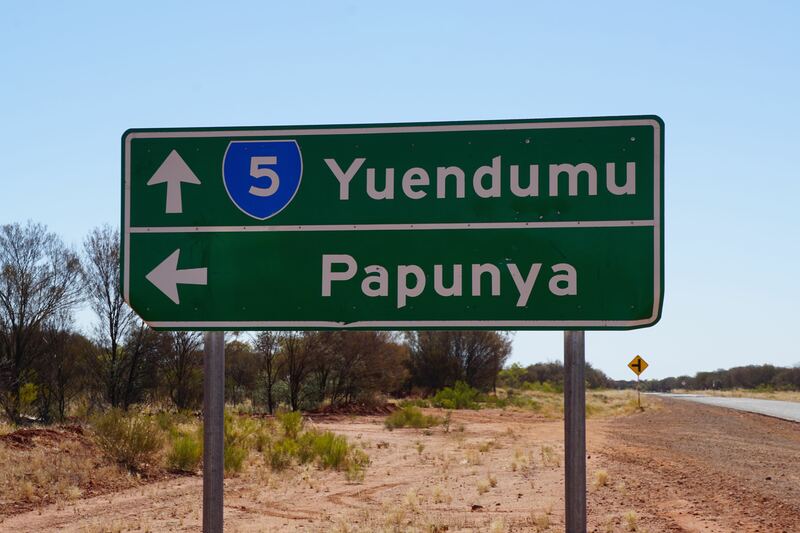 We hope to have a few days in Yuendemu after we get back from Darwin. 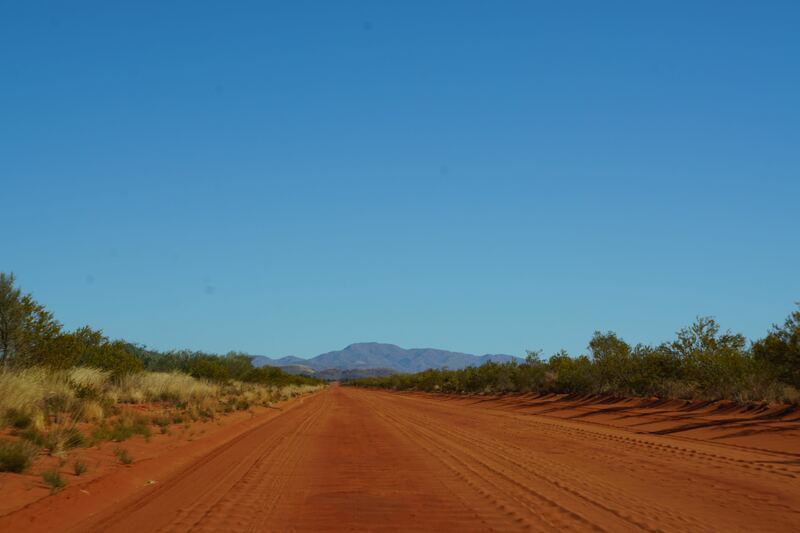 The road from Stuart Highway towards Yuendumu is sealed. 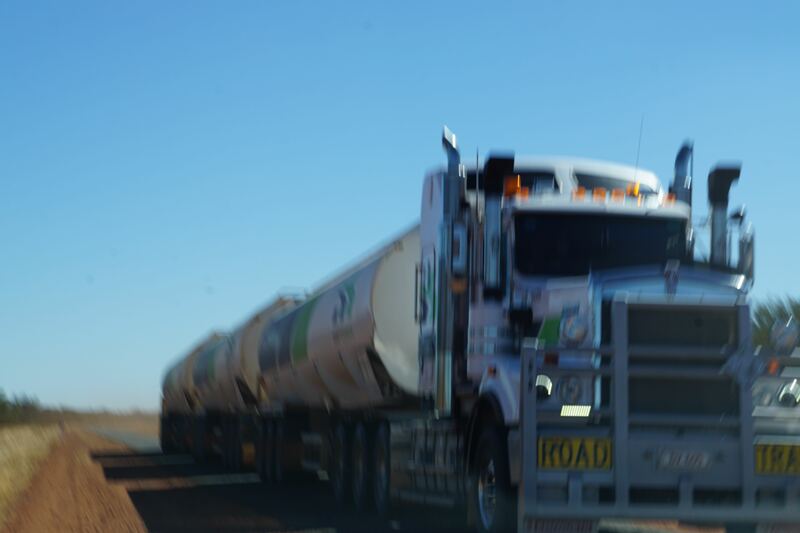 But only for the width of a big road train. When you see one coming you get way way way off the road! 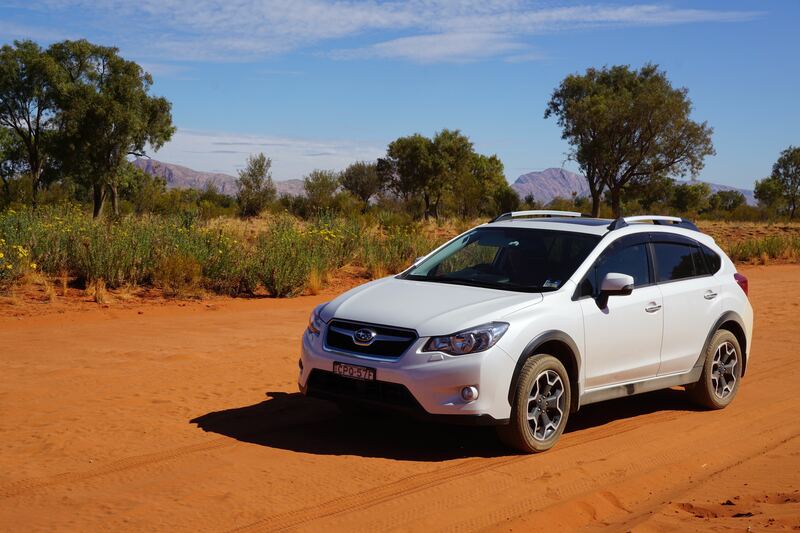 At the turn off to Papunya, the road changes to red dirt. Stephanie did a sketch on paper. We loved it so much we commissioned her to paint it on canvas. Here’s the progress after her first hour of painting. 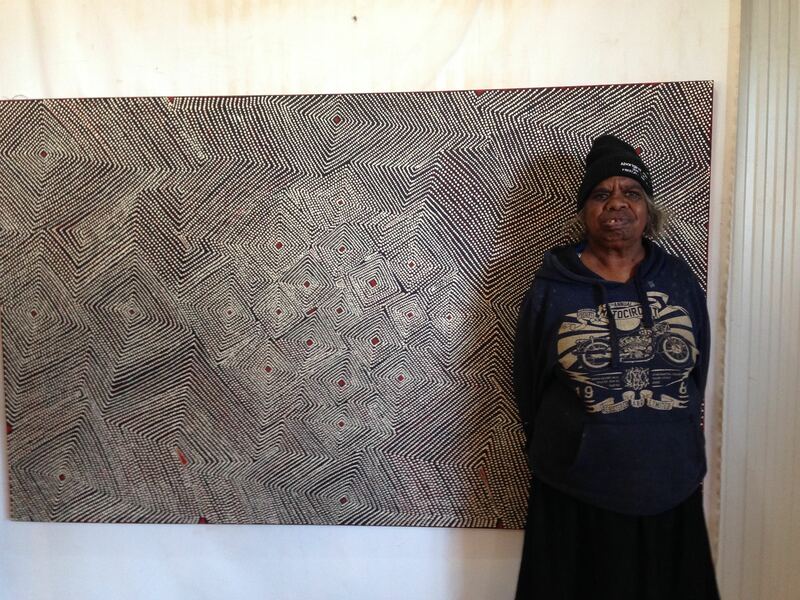 Maureen Poulson with her fabulous painting. We wanted it but some tourists came through and bought it before we could grab it. 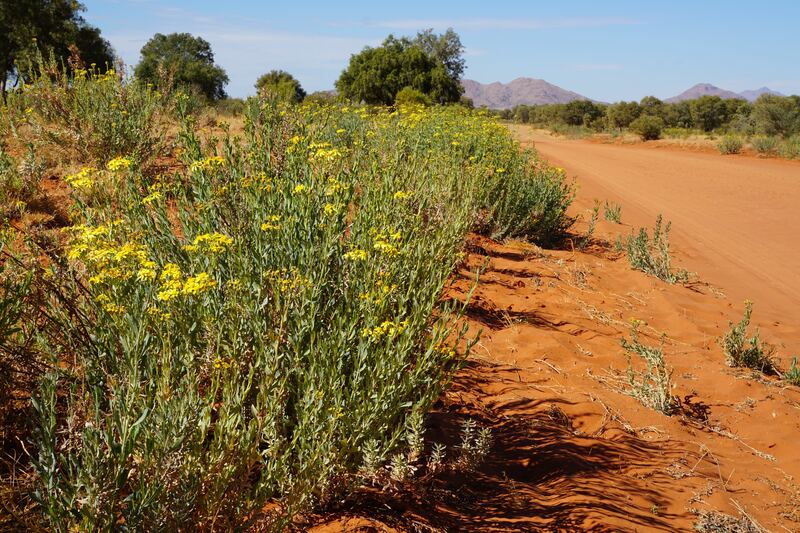 Papunya. Everywhere in town you can see the mountain range. It changes in colour all day long. This was taken mid morning. 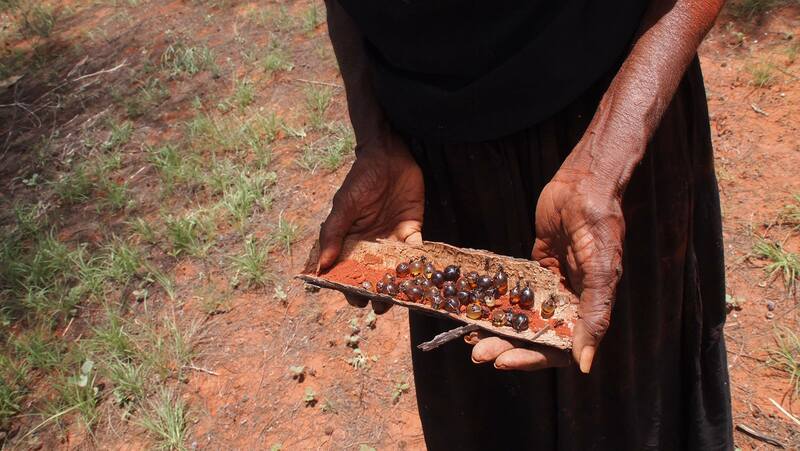 One of the treats at Papunya was finding Ininti trees and collecting our own seeds. 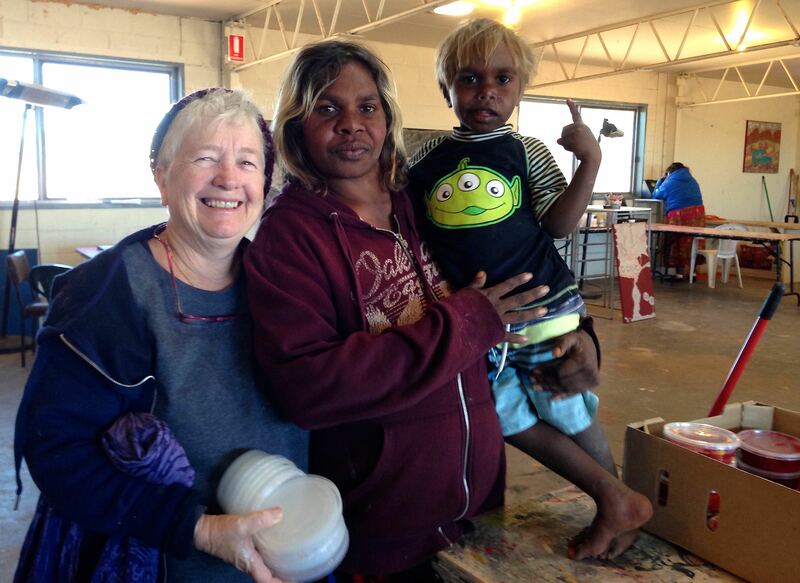 Jude has contracted with some local Aboriginal women to make lots of key chains with seeds and nuts. 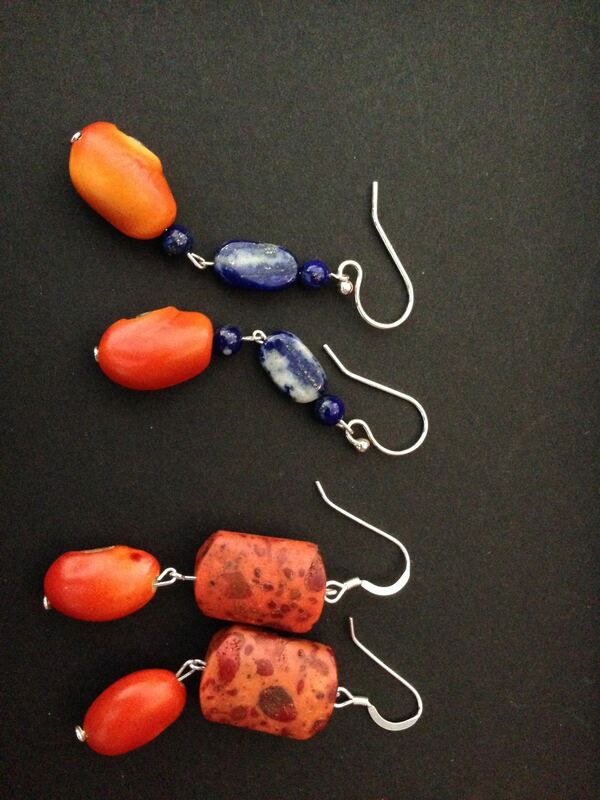 Now they can use some of the seeds we collected in their designs. 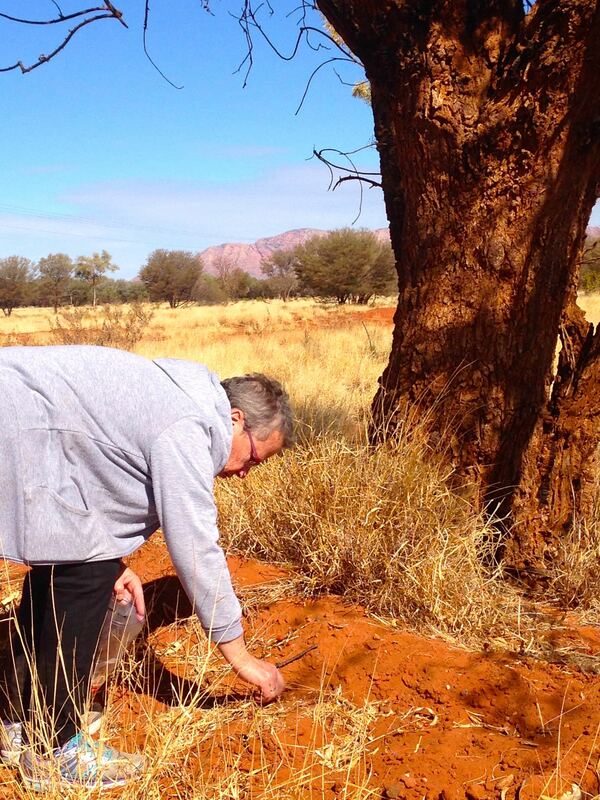 Jude collecting ininti seeds on the edge of Papunya township. 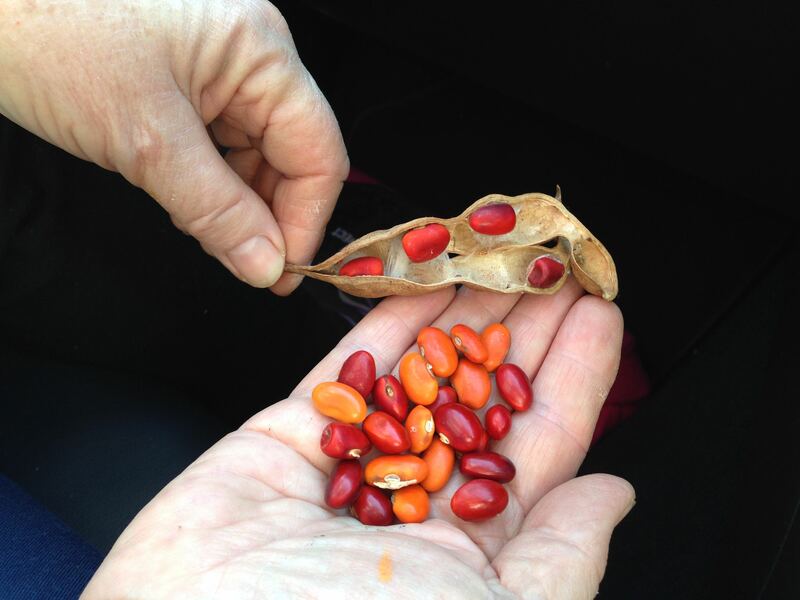 Ininti seeds and a pod of seeds. 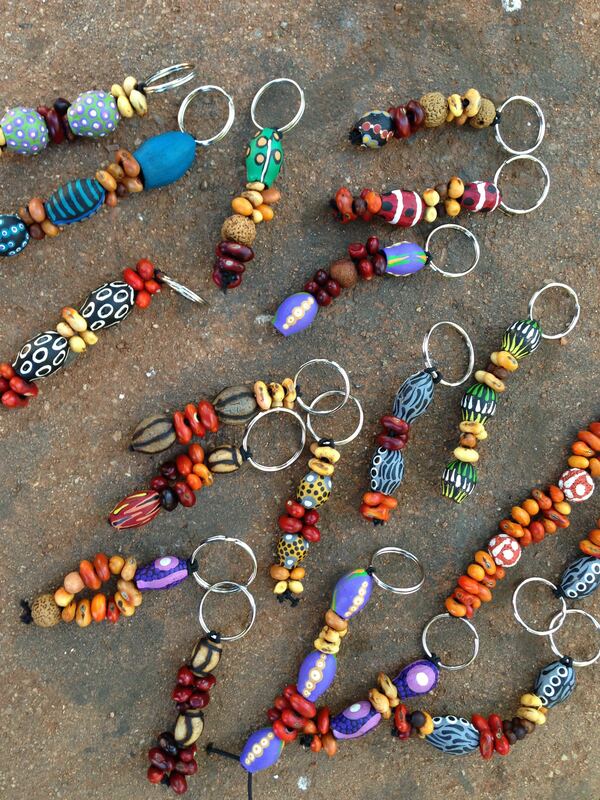 The first batch of keyring. Over a hundred more still being made. 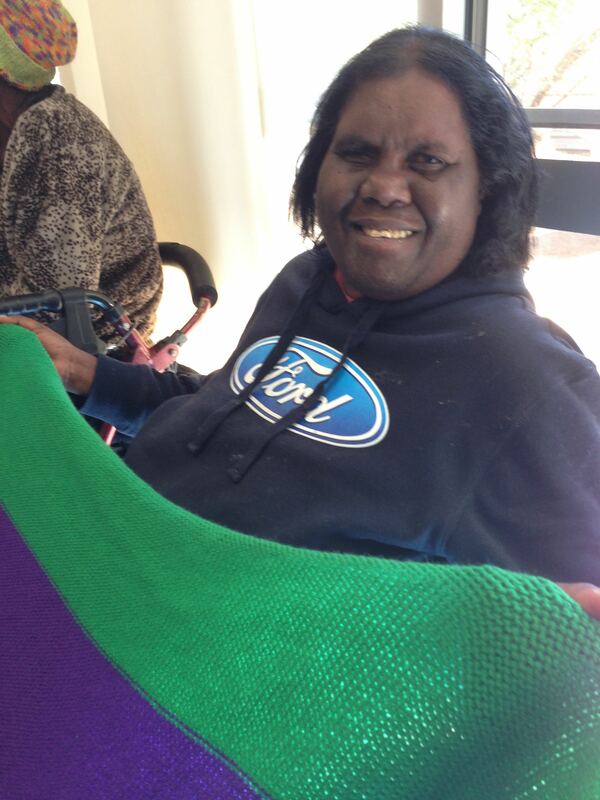 Daf’s sister, Joyce, and some of her friends have been busy making colourful knee rugs for the people at Purple House. 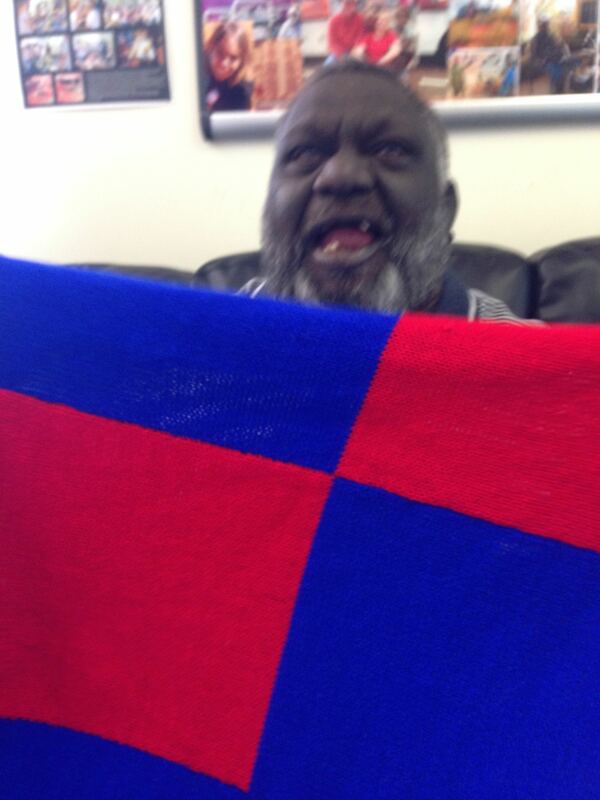 They’ve sent 25 rugs within the last month! Here are some of the very happy recipients. 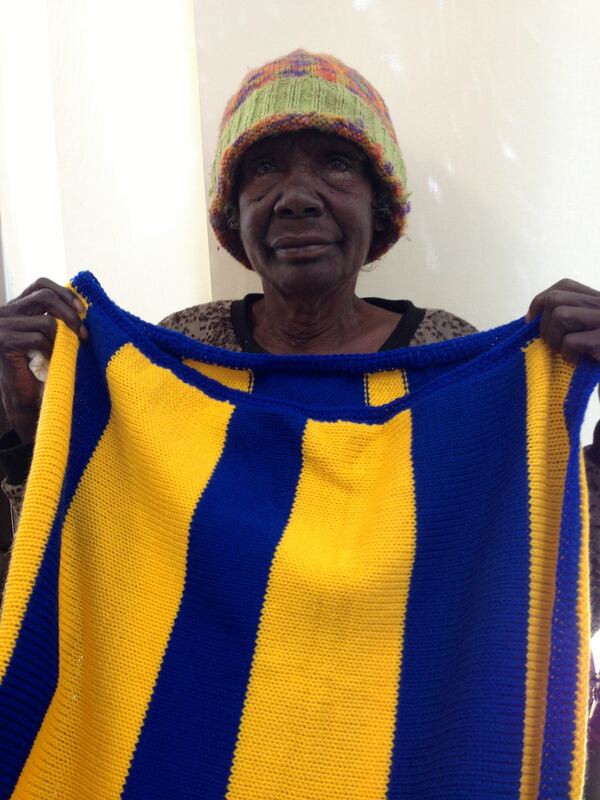 One of the rugs was given to Daisy Nakamara Leura. 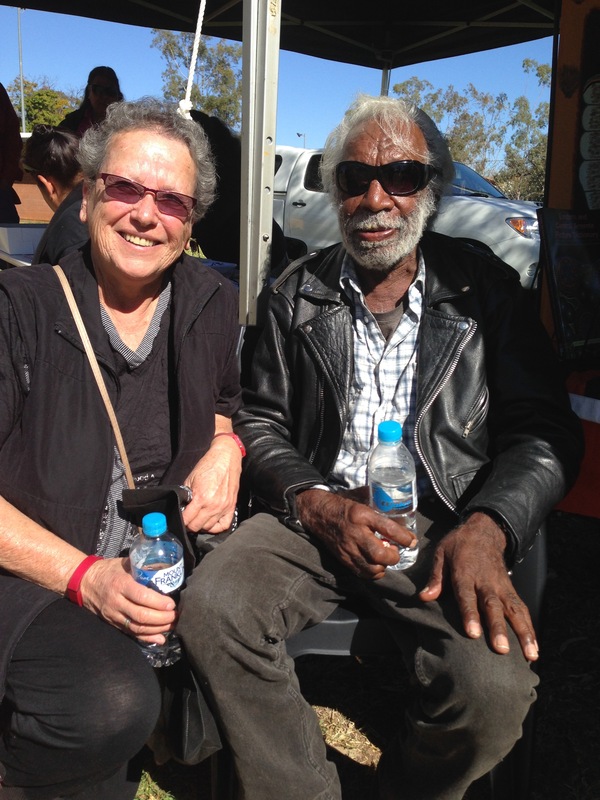 Daisy’s husband, Tim Leura, was one of the original Papunya artists and Daisy used to help him with his paintings. 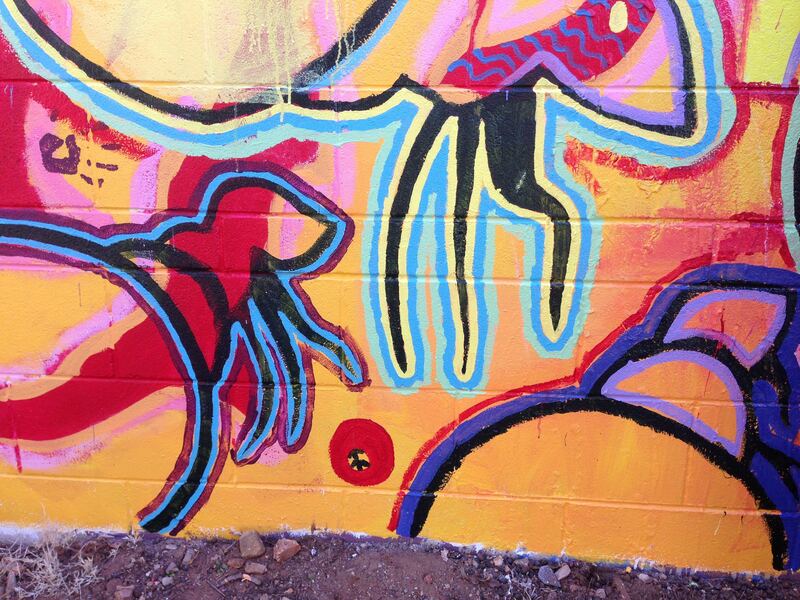 One of her paintings is the image for Mulapa. 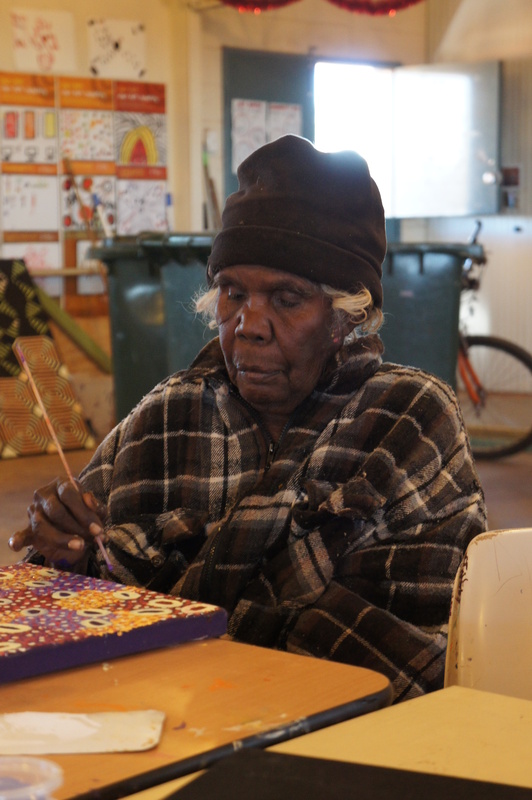 Daisy has been paintings at the art centre at Papunya nearly every day for years and years. 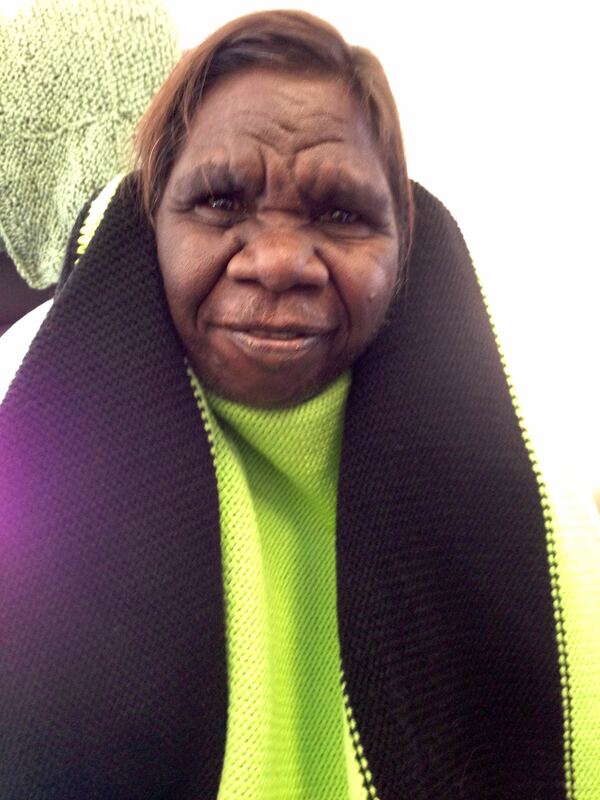 We first met her on our trip to Papunya in 2010. 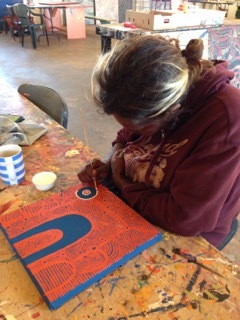 Daisy in 2011 when we visited Papunya again with Jeanette and Julia. 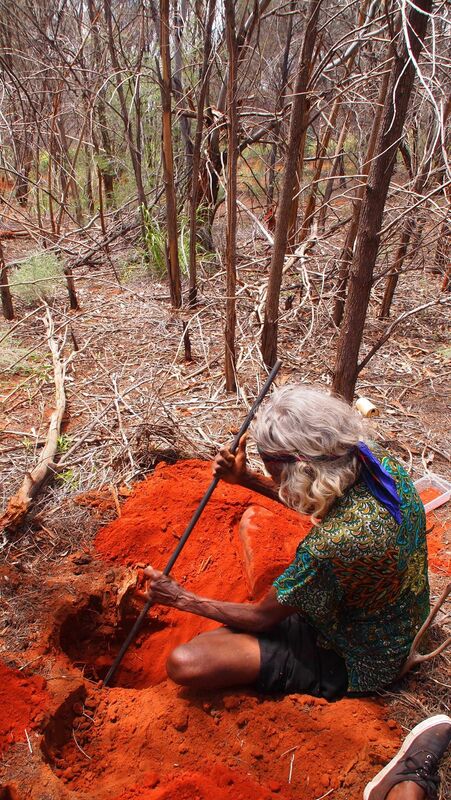 Martha digging for honey ants. It’s hard slow, patient work. 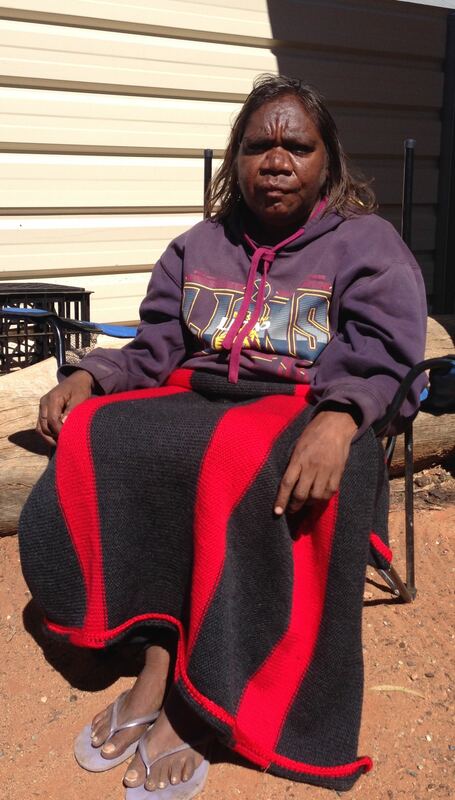 Daisy is in hospital in Alice Springs with Parkinsons and they’ve decided she’s not well enough to return to Papunya. 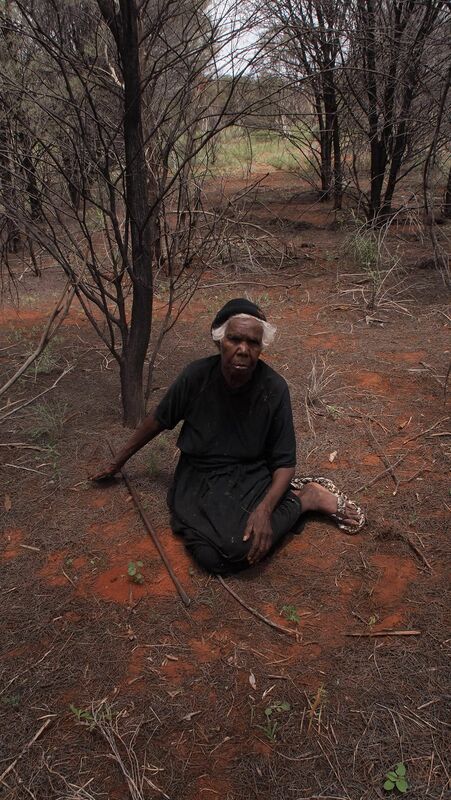 It’s heartbreaking to hear her begging to go home to Papunya. 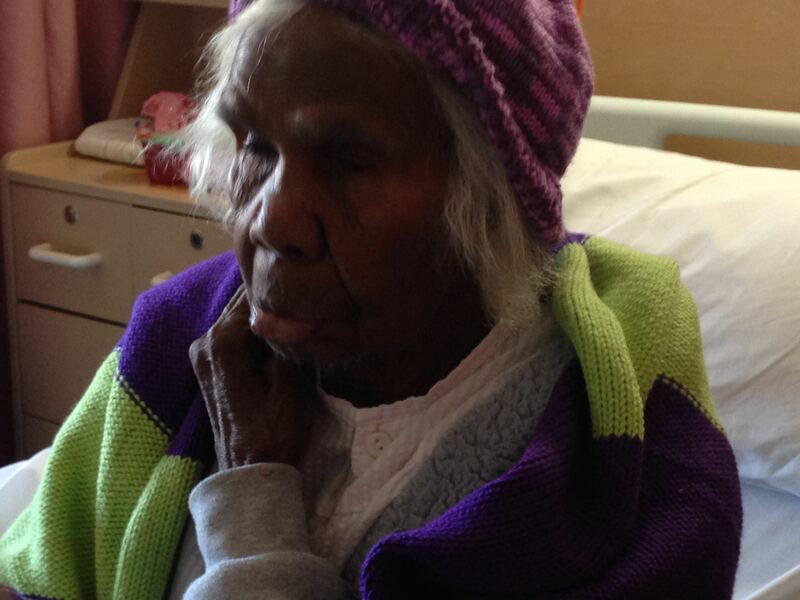 She’ll have to end her days alone in a nursing home, away from country (on other’s country) and away from family. This is a common problem in the centre. There aren’t enough facilities in the communities to care for sick or aged people. 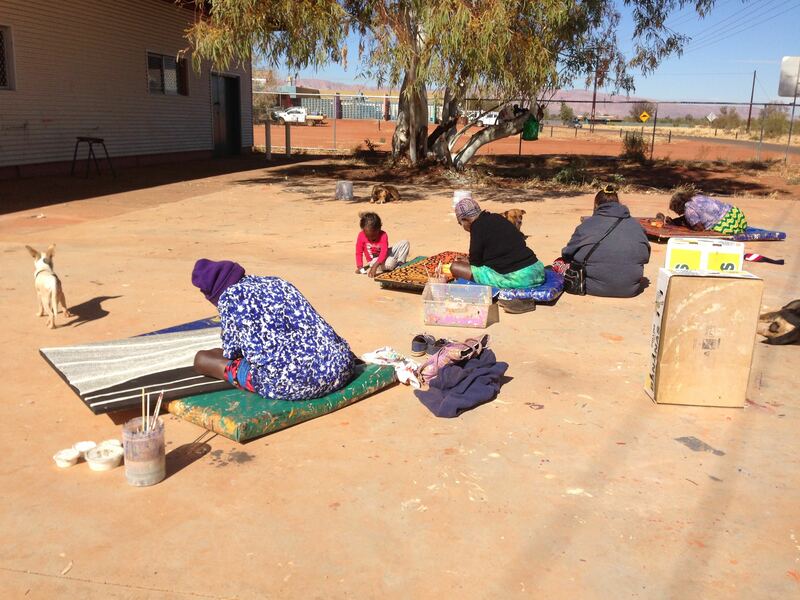 There’s good medical care in Alice, but not enough support services to care for their emotional/social needs. If Daisy was a renal patient from Kintore she’d have wonderful care from Purple House in Alice and could be taken by the Purple House bus back to country for visits. 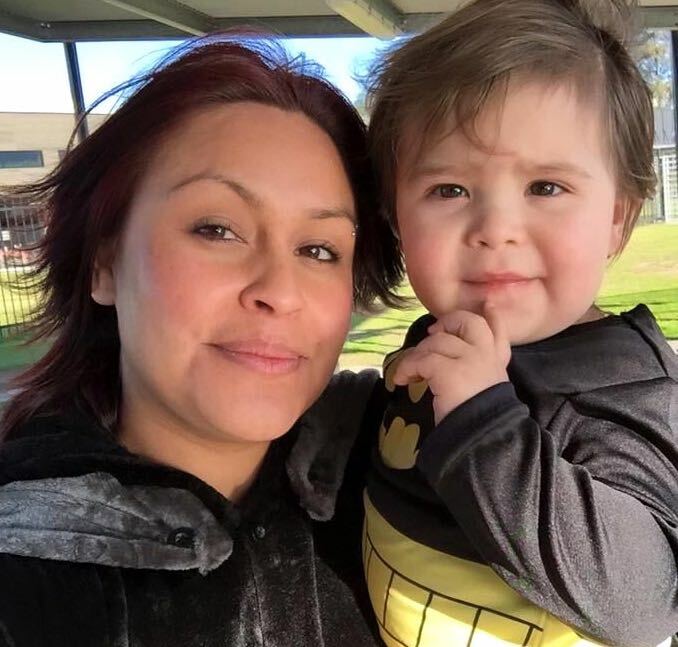 She might even be able to return to country and have her medical care there. But there is no equivalent to Purple House for other medical problems. We feel sad and powerless. 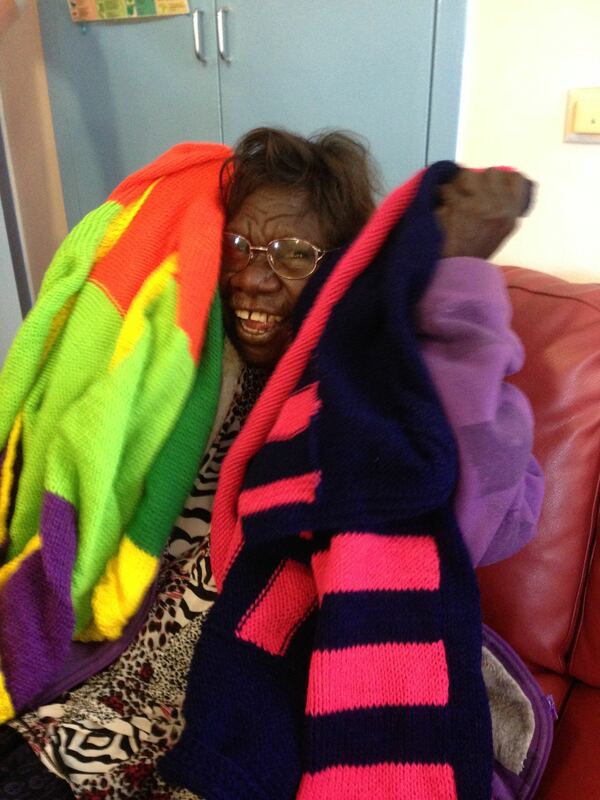 But so happy to be able to give her one of Joyce’s rugs. This weekend is Gay Pride Carnivale (Alice’s Mardi Gras). Parties and films and a forum and a fair. All great fun, although rather less busy than we’re used to at Mardi Gras. 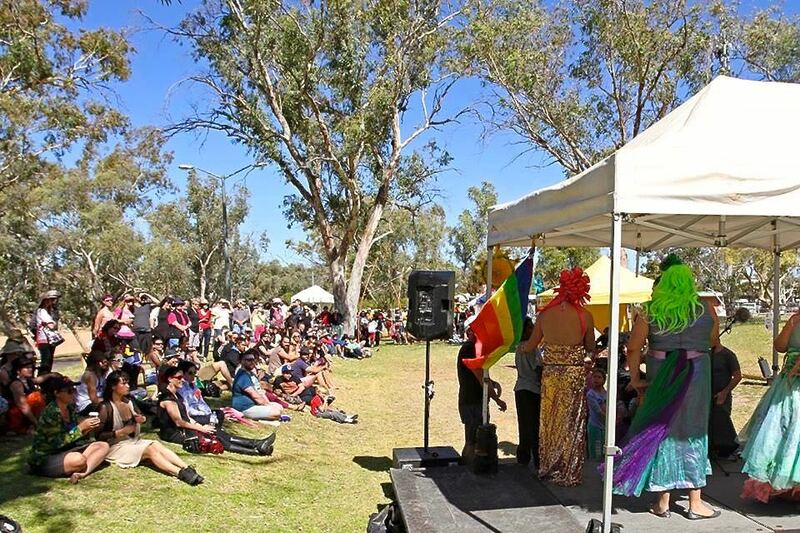 Pride film festival at Totem Theatre next to Todd river. This photo was taken about 5 mins before advertised starting time. We are slow to learn that “Alice time” means 30-45 mins after advertised time. It was nice to have a drink in the courtyard while we waited for the gay community to turn up. 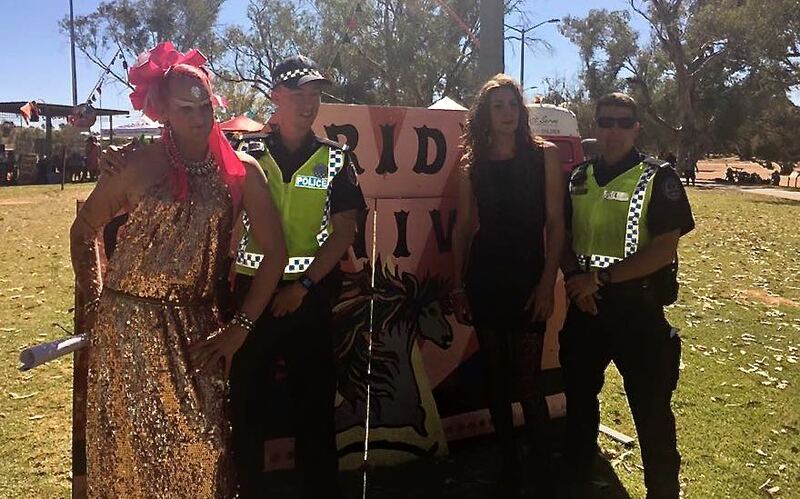 Sister girls and cops celebrating Pride at Fair Day. This is a significant photo because there has been lots of tension between some of the lesbian/sister girl community and the police. Our friend Mel, a cop and a lesbian, is trying to do something to heal the rift. 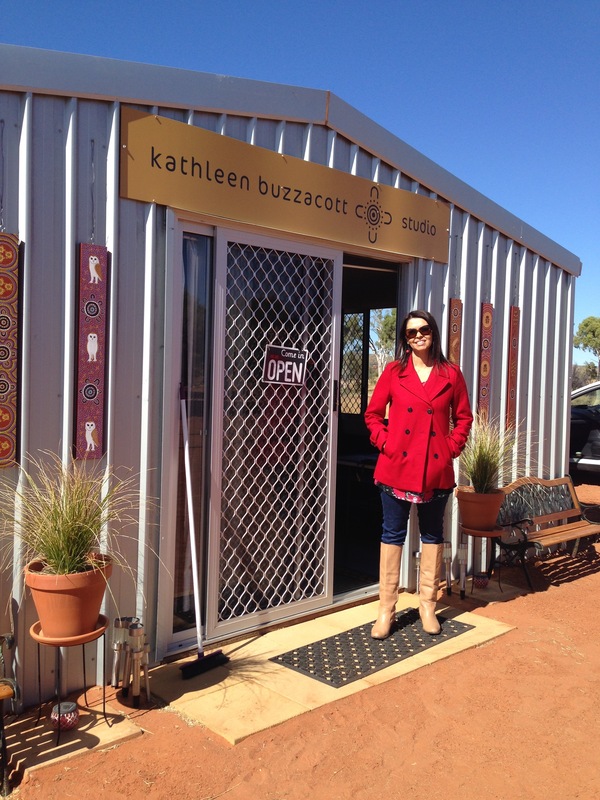 One place we love to visit is Kathleen Buzzacott’s studio out near Simpson’s Gap. 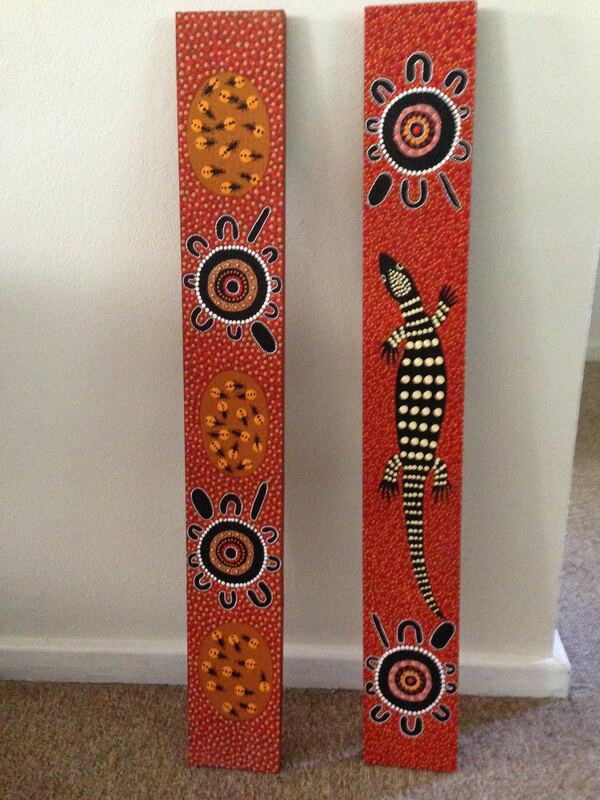 Kathleen makes gorgeous jewellery and she’s painted some boards for us to hang in the courtyard. We’ve also done some “work”. 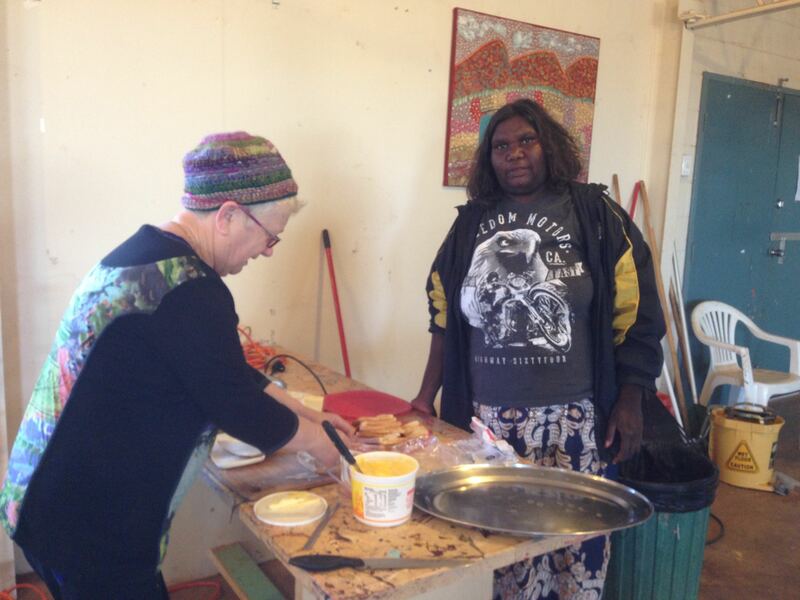 Jude looked after an Aboriginal gallery for a friend for a couple of days and Daf did a reflective practice workshop. 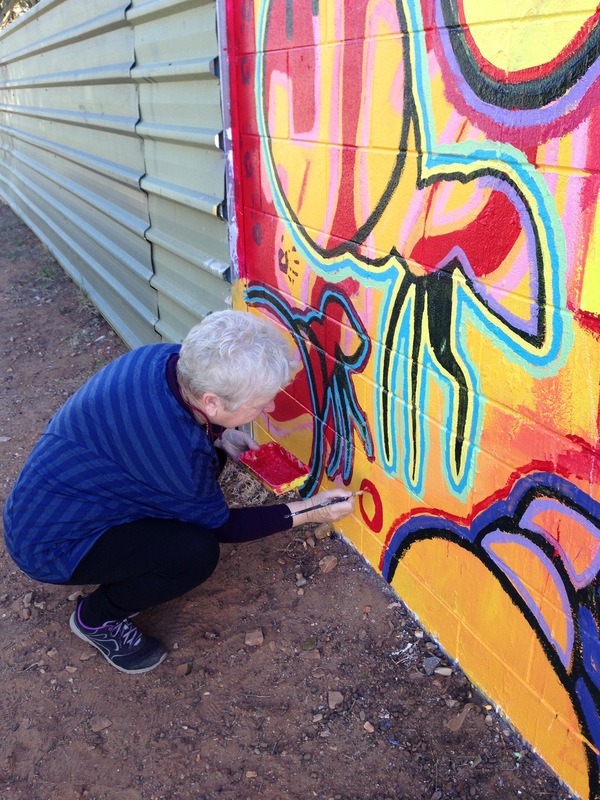 There’s a great community of very reflective practitioners in Alice. 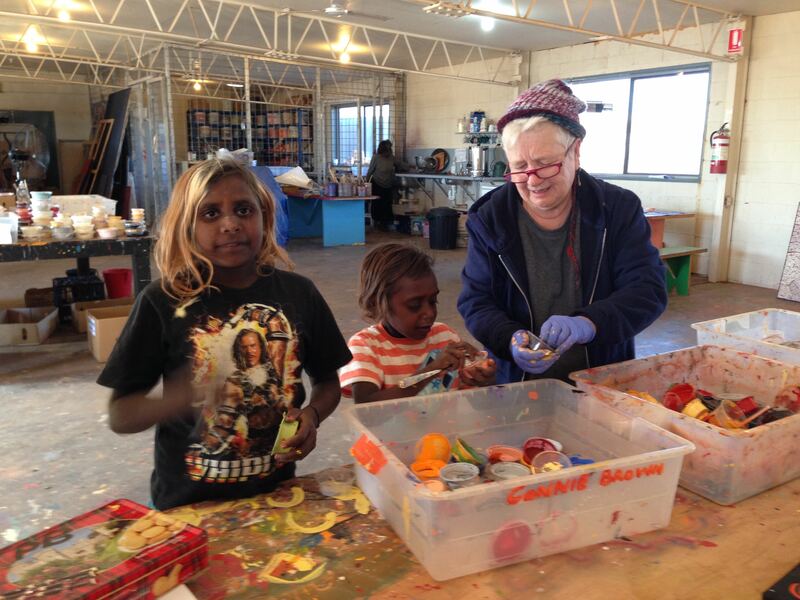 Daf has learnt tons from them and it’s all helping to fine-tune her ideas for the book and workshops. Lots of fun with cooking and eating with friends. Sometimes we even do the cooking. We’re so glad we brought our thermomix with us. Will have to take her as hand luggage when we fly home. 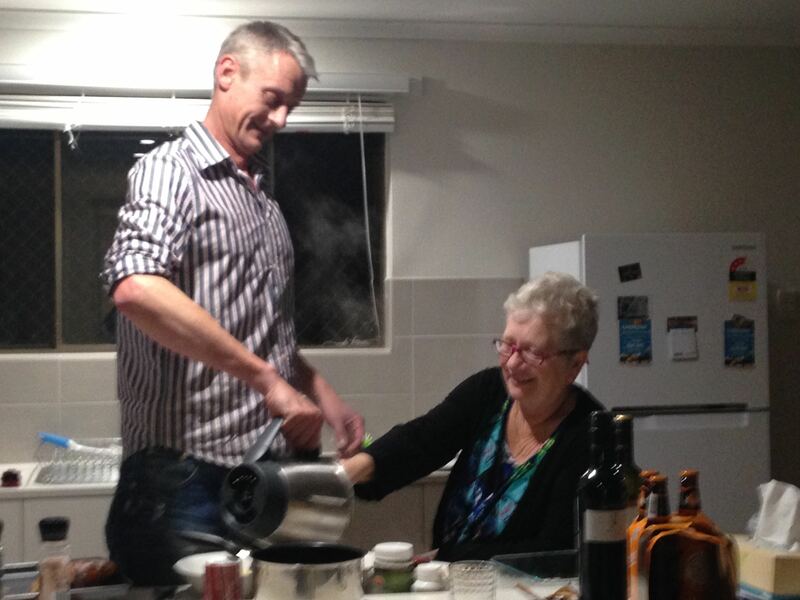 Daf showing Karl how to use the thermomix. We’ve shown a photo of Karl in a previous blog, but never of his partner Ric. So Ric posed for us in their gallery – Yubu Napa. Ric modelling a classy beanie. Our friends Maree and Shaz have a fabulous fire pit in their garden. Last night Daf had a go at her first damper. 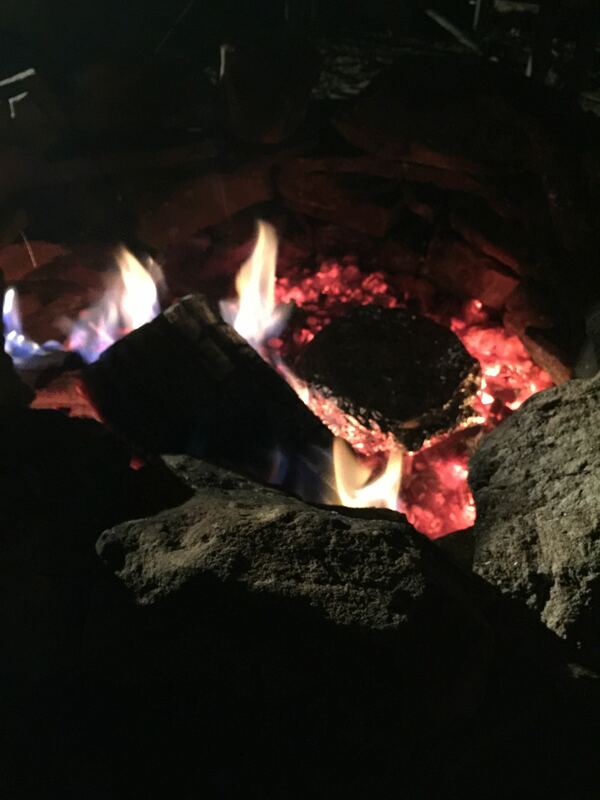 It looked great in the fire, but got burnt to bits. More practice needed! 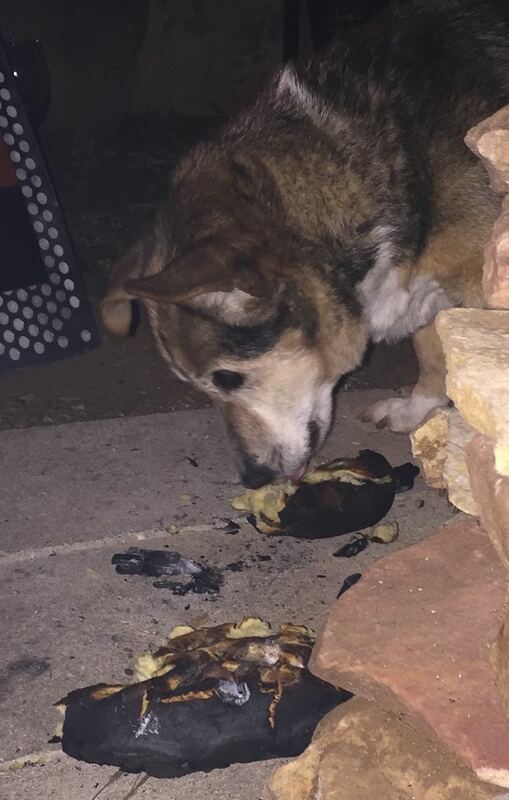 Although Kevin, Karl and Ric’s dog, really enjoyed it. 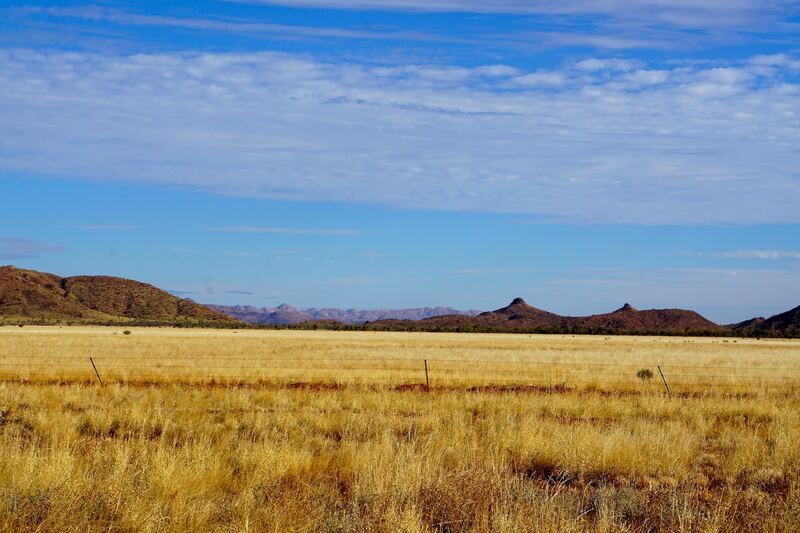 One more blog in 5 weeks (after Darwin Aboriginal Art Fair and Henley on Todd and Alice Festival and Desert Song and Desert Mob and lots of other little pleasures). Then we’ll be home and having a social whirl as we try to catch up with you all. 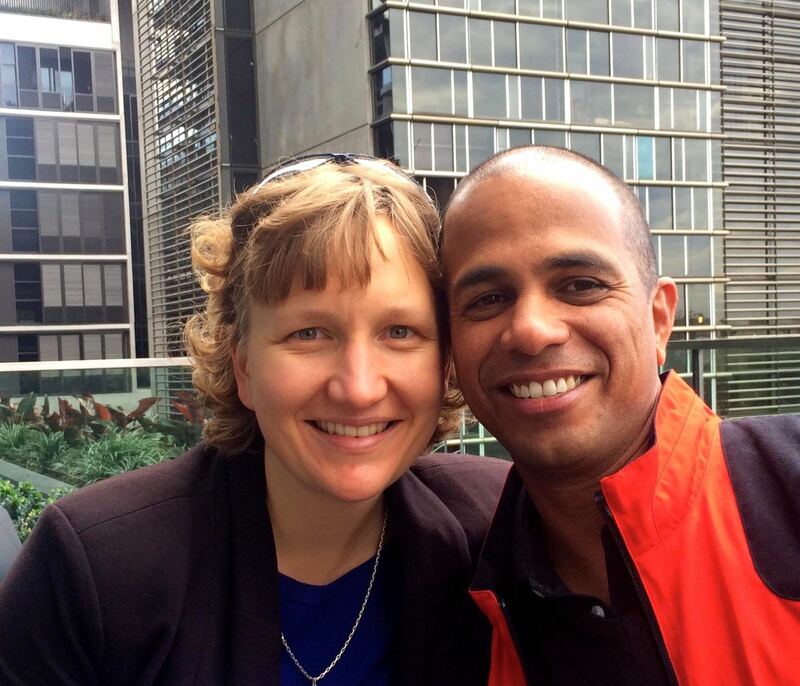 Thanks you Daf and Jude for sharing your wonderful experiences .. great blog! 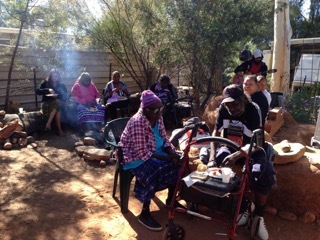 You girls are just having the most amazing time immersed totally in community life. Any wonder you want to stay longer. Keep enjoying.